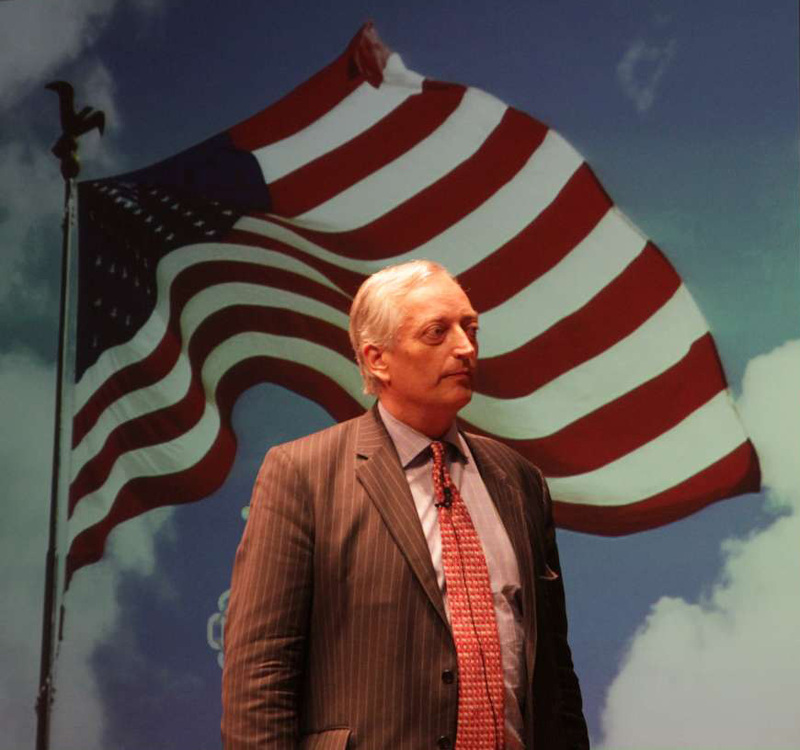 Lord Christopher Monckton gave a real Reason Rally at the Joan B. Kroc Institute for Peace & Justice Theater at the University of San Diego. The crowd rose to their feet on several occasions as Lord Monckton presented the truth about global warming "science" and the consequences to human freedom. The Viscount Monckton of Brenchley mixed good humor and good information for an terrific presentation. 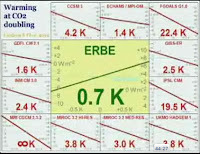 The primary formula used to calculate "feedback" warming from CO2 is clearly wrong. Observational data was presented that clearly shows global climate is cooler now than it was in the Medieval warm period and within the natural climate variation of the last several thousand years. The "feedback" formula was shown to be a factor of 4.4 times the actual observed and measured value. Further, the actual "feedback" works to stabilize temperatures, not exacerbate them. The computer models used by the IPCC are based upon a decline in escaping heat with increased CO2. The observed data, in green at the center, shows the opposite result. 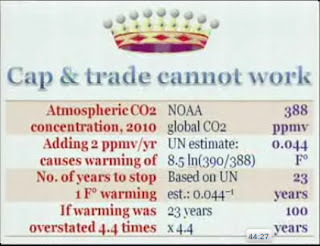 Lord Monckton walked through the four IPCC climate reports and showed the evolution of lies and "tricks" used to create and maintain the Global Warming Scam. 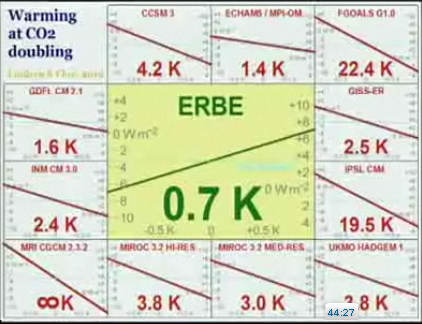 The take away from this portion of the presentation is the discredited "Hockey Stick." To create the hockey stick, numbers were not just manipulated and "tricked," they were generated. You can read an entire book on this subject called The Hockey Stick Illusion. Another key presentation point was on the validity of "Consensus." Science is not consensus and consensus is not science.The notion that "2,500 scientists can't be wrong," is just a fallacy. The climate models and data actually all boils down to one scientist who used the formula for electrical feedback (aka microphones) as the basis for the modeling of CO2 "feedback." There is no scientific consensus on how much the world has warmed or will warm. The point to the conference was the peril California faces this summer. In August 2012, California holds the first cap and trade / carbon tax credits auction. It is expected to raise one billion dollars for the state. At that point, this will become a revenue source with big bank and political ties that will never be undone. CO2 becomes a commodity to be traded and taxed. It will mark the largest transfer of wealth from private citizens to big banks and big government in American history. Europe is already wasting hundreds of billions on this useless scam. The impact on the economy is apparent. The impact on the environment is not. The best case scenario is that California will raise 400+ billion dollars in taxes to reduce global warming by .001 degree Celsius over 100 years. In reality, the scheme will enrich the regulators and break the public. It will do nothing of worth. In Britain a similar scheme was passed with absolutely no measurable benefits. No study to gauge the benefits of taxing the public for "carbon pollution" was done prior to the law being passed. Estimates of revenue generated were completed. In Europe 5/6 of government decisions are made by regional regulators who are not elected nor held accountable. America, through cap-and-trade and agenda 21, is facing the same fate. America is bowing to the same global governance scheme. We Americans will have all the trappings of democracy without the messy democratic process. This important and hugely successful event was organized by Americans Protecting Property Rights and CfactSoCal.org. The hall was overflowing and video conference rooms were required for the additional attendees. Lord Monckton was friendly and open to questions before and after the event. The excellent efforts of the volunteer organizers are greatly appreciated. It is good to see such forward thinking and competence in organization from fellow tea party volunteers. The familiar faces and welcoming attitudes are a hallmark of the movement. For examples of attitudes from the left, look no further than ThinkProgress.org's coverage of Lord Monckton. You can also follow Lord Monckton's exploits as a contributor at Whats Up With That. Americans Protecting Property Rights is also found on facebook. From the beginning of the Global Warming Hoax, I have been trying to expose the utter ignorance of the entire argument. It appears the end game has arrived. While we have successfully debunked the science, politicians are woefully ignorant of the facts. There are also progressive forces who are actively trying to destroy our economic and political freedoms to undermine our constitutional rights in order to accumulate power and control. California Assemblyman (77th) Brian Jones commented that many lawmakers who passed The California Global Warming Solutions Act of 2006 (AB32) did not know what it was. It turned out to be the United Nations 1997 Kyoto Accord. AB32 is the entry point for global governance. The members of the California Air Resources Board (CARB) are appointed and operate outside any legislative oversight. CARB will be implementing Cap and Trade. "I was born in a democracy. I will die in a democracy." America is an idea, based in freedom. So I proclaim that our ally Lord Monckton is a great American. We need more great Americans to stand at our side. I was there to hear Lord Monckton. He is awesome. He understands the Founders' original intent far better than many ill-informed Americans. Sad. I pray that our efforts to combat and totally defeat Agenda 21 will come to fruition. If we succeed, as I think we will, our Founders will then be praising our efforts from Heaven. Great post and excellent summary. The warmists are fools to believe we will give up our economic liberty without a fight against their theocracy.